UNIONDALE, NY, May 26, 2011 – New York Islanders captain Doug Weight announced his retirement today from the National Hockey League. He will remain with the Islanders organization as an Assistant Coach and Senior Advisor to the General Manager. Weight, a veteran of 1,335 NHL games, finished his career, placing 65th place on the NHL’s all time scoring list with 1,033 points. The Detroit, MI, native’s 748 career assists rank 40th all time, while his 1,238 regular season games played are the 76th highest total in NHL history. 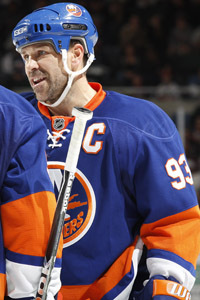 Weight, a four-time NHL All-Star, was named the 12th captain in Islanders history on October 2, 2009. Originally drafted by the New York Rangers in the second round (34th overall) of the 1990 NHL Entry Draft, Weight’s career included stints with the Rangers, Edmonton Oilers, St. Louis Blues, Carolina Hurricanes, Anaheim Ducks and the Islanders. The 5’11, 196-pound center played in 97 NHL Playoff games, posting 23 goals and 49 assists. He won his first and only Stanley Cup with Carolina in 2006. Weight reached the 1,000 point milestone with the Islanders on January 2, 2009, becoming the eighth American-born player and 73rd NHL player to reach 1,000 points. On the international stage, Weight won a silver medal with the United States at the 2002 Winter Olympics and also skated with the 1998 and 2002 United States Olympic Teams. He also represented the U.S. in the World Cup of Hockey in 2004 and in 1996, helping Team USA win the championship in ‘96. Weight appeared in one World Junior Championship in 1991, leading the entire tournament in scoring, and he also played in the 1993, 1994 and 2005 World Championships for the United States.